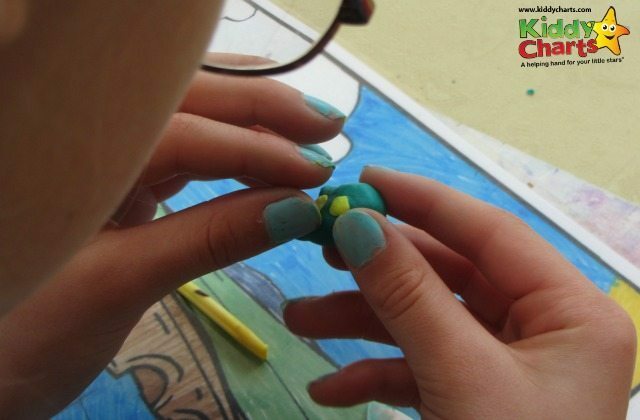 My daughter has been keen to use Fimo for craft for some time. I have always resisted because it isn’t a craft supply that I am used to using. However, having been asked to make a craft with the money we have saved by going with Cavendish Online rather than another comparison site, I couldn’t keep saying no. We looked at life insurance cover on the site for £100,000 and the difference in quotations for a year’s cover was enough to buy ourselves a paintbrush and a wee bit of Fimo for that all important mascot building. Not content with making just one thing, they went for a whole menagerie! It is amazing what fun you can have with a simple saving ;-). We created everything from a tiger, to a penguin, a monkey and even a fish (from left to right in the top image above). We just used YouTube for a bit of chubby inspiration and we were away! Why don’t you have a go too? 1. Decide what chubby mascot you are going to make. You need to make a small ball for the body. If you are making the penguin, you will need to start with a wide sausage, rounded at the top and flat at the bottom. 2. Create each one of the limbs, ears, tails, flippers, fins or beak – take your pick! Ears and fins are made from small balls and moulded into shape. The limbs are created from small sausage-shaped rolls, as is the tail. The spots on the fish are made from balls flatted to the right size. 3. Attach each spot or limb by smoothing them down using either the end of your paintbrush, or any other thin, pointed tool. The tools that come with scratch art work really well! 4. Cook the Fimo in the oven once your chubbies are ready. Typically 110 degrees for 30mins, but if you don’t feel it is cooked enough, it is fine to put it back in the oven. The most important thing is to not let it burn, as it gives off noxious fumes. 6. The kids then decided they wanted their mascots to have their own “world” so we used on of our home-made placements to give them one – what do you all think? As you can tell, once you get the basic shape, you really can create anything. Fimo is wonderfully versatile. This is a sponsored post, but we really did have a lot of fun with this and only spent a little to get a lot of fun!